29 June 2016 – The industrial value of collaboration within TiFN was the central theme of the 7th Annual Conference, held June 1st in Wageningen. Industry partners shared the impact of the latest TiFN-generated scientific insights with the audience of around 100, who enjoyed an inspiring, informative day extending knowledge and networks. The Annual Conference, now in its 7th year, is open to TiFN research and industry partners only. The 2016 programme included lectures, publication pitches and interactive breakout sessions – organized together with AgriFoodTop, TKI Agri&Food’s key networking event – and allowed participants to immerse themselves in current issues such as immunology and allergy, the biology behind perceivable consumer benefits and improvement of product and process quality by structure. The event also saw the award of TiFN’s annual Publication Prize, and the Dutch final of Ecotrophelia, a food-design competition for students. 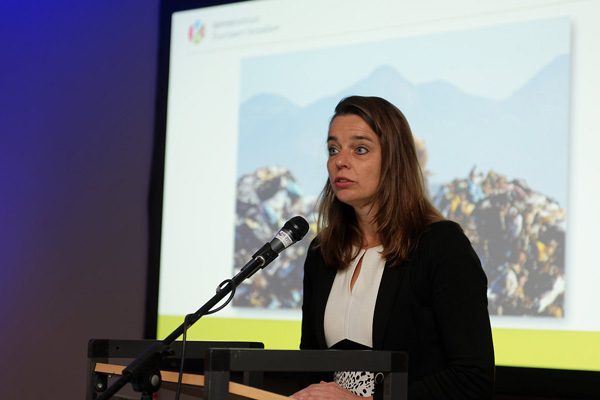 Lectures by industry partners – Hester Klein Lankhorst from the Netherlands Institute for Sustainable Packaging (KIDV), Dr Marcel Wubbolts from DSM, Dr Margrethe Jonkman from FrieslandCampina and Dr Hanno Cappon from Danone – highlighted how TiFN functions as a springboard for innovation. “Working together multiplies your research investment financially and intellectually, as long as you have clearly defined your strategy first. Then, you can seize the opportunities out there”, said Cappon. For a photo impression of the Annual Conference, click here.